Winner of the Vermont Sales Festool project Lois Schwartz with her rechargeable lawnmower design. Battery-powered lawnmowers may not be big news in South Africa – yet. A student exam project could point the way towards a viable design for local use. 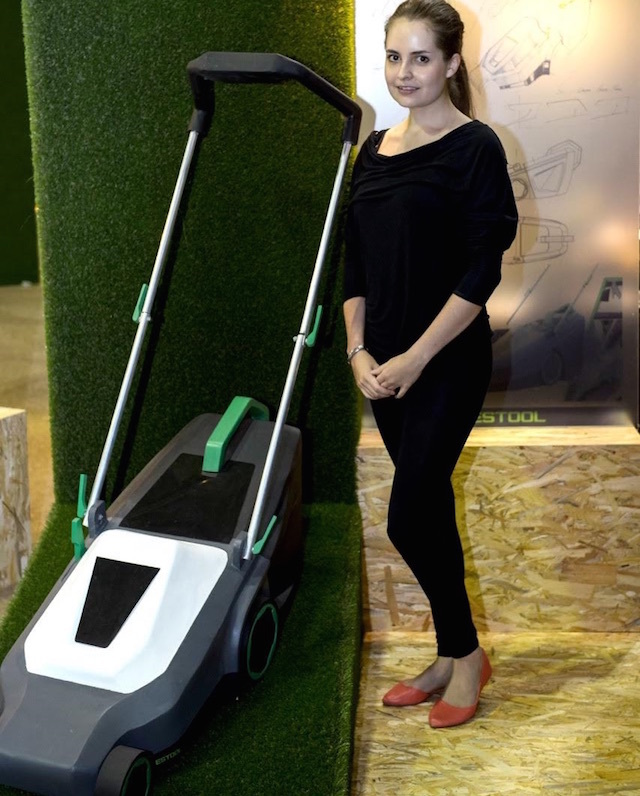 Students at the University of Johannesburg’s Faculty Of Art, Design Architecture and Industrial Design were given the job of researching and designing a rechargeable lawnmower for homeowners with small gardens. The rechargeable lawnmower was targeted at one of three markets using the following brands as a vehicle: Festool (high level market), Makita (medium level market) and Black & Decker (lower level market). Criteria included four wheels, a grass catcher and a foldable handle. Students had to identify the intended market and their design approach had to carefully consider how people use lawnmowers, adjust the cutting height, clean the machine and store it along with its requisite recharge station or plug point in the limited space available. On developed markets such as the US, homeowners have plenty of cordless mowers to choose from, as our US colleagues at Popular Mechanics found in their group test. They gathered seven battery lawnmowers and operated each in mulching mode until its battery died or its cut quality dropped off significantly.